There used to be times when people bought pressure washers with the sole purpose of cleaning their cars. Time passed and they become aware that a power washer they can handle far too many cleaning tasks around the house besides car wash. Those include keeping their walkways and patios squeaky clean. We've compiled few simple tips for pressure washing brick patio and walkways. Having brick patio in your yard adds beauty to the landscape and a bit tricky cleaning task in your schedule. Before pressure washing your patio, please observe carefully how it is constructed. If is it made of bricks, is it very likely to be prone to stains as brick is porous. Porous materials are more difficult to clean especially if the stains are stuck deeply in the brick. 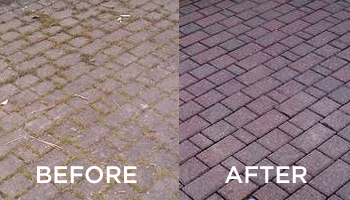 Pressure cleaning can be a good solution, providing that joints between the bricks allow it. Take your time to inspect the material laid between the brick and then decide whether pressure washing is appropriate. 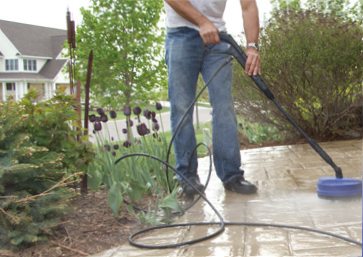 If the joints are filled by concrete or mortar, then your patio may be cleaned with pressure washer using a 25 or 40 degree nozzle. In case the bricks are laid in gravel or sand, it is not really recommended to pressure blast them because this technique would simply wash the sand/gravel away. You may, however, buy patio cleaning equipment. A patio cleaner is basically an attachment to the pressure washer, with a round shape and two rotating nozzles inside that spin and clean below the hover. It is best to hire professionals to do this task for you as they have the necessary equipment and knowledge to perform it. Before pressure cleaning, make sure to remove any obstacles on your way like furniture, plants and equipment. Unplug electrical fixtures, cover all open or exposed electrical outlets to avoid possible short circuit. You should wear all recommended safety gear including safety goggles and gloves. If you are using the pressure washer for the first time, make sure you read the manual and you are familiar with the equipment before you commence the work. Use 25 or 40 degrees nozzles for standard cleaning and start cleaning far from the surface to avoid damage. Slowly get closer to the surface. Make sure you are far enough to not damage the object, but close enough to effectively clean it. Be extra careful if your pressure washer is more powerful than 2000 PSI. Use chemical dispenser or black-colored (soap) nozzle to apply the detergent. Allow it to work for 5-10 minutes, and then rinse thoroughly with 40 degree nozzle. Pressure washing walkways is not much different to cleaning a brick patio. As discussed above, the main difference lies in the material the walkway is made of. If it is made of bricks joined by concrete or mortar, use 25 or 40 degrees nozzle and clean it the same way you would normally pressure wash surfaces. If the brick walkway is based on gravel or sand, then it will be most appropriate to utilize a patio cleaner. In case your walkway is made of concrete or outdoor tiles, then just blast it with pressurized water stream like you normally would wash solid surfaces. For even more pressure washer uses and tips, check our Tips and Tricks section.